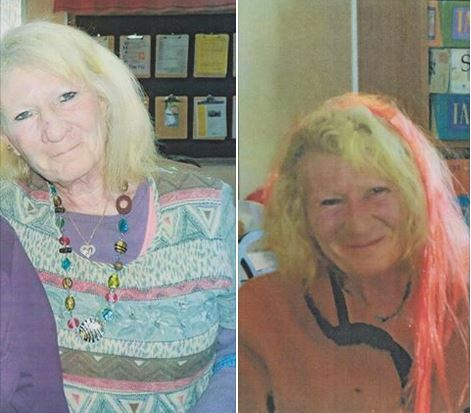 CEDAR CITY – The Cedar City Police Department is requesting the community’s help Monday in locating a missing woman last seen in Cedar City on April 28. The missing woman, 59-year-old Deborah Carver, suffers from multiple health conditions, including dementia, the Police Department said in a press statement issued Monday afternoon. The circumstances surrounding Carver’s disappearance are still under investigation, the statement said. May 18: Cedar City Police said its investigators are still working on this case and, unfortunately, there is nothing new to report. The department is continuing to follow up on leads as they are received. Anyone with information regarding Carver’s whereabouts is asked to contact the Cedar City Police Department at 435-586-2956. I am the founder of a non profit called Textwich.org We find missing people actually by feeding the homeless in the areas we believe our subjects might be. We put hand written notes from our subjects families that are done by a calligraphy artist with a picture of them on sack lunched and then hit the streets and parks to distribute them to the homeless who in turn give us tips on where to locate them. We are based in southern Ca but for several months I have done various searches for Macin Smith who is missing from Salt Lake City. Last week the Gephardt daily news wrote an article about Macin and in it was Elizabeth Smart who has been helping Tracey Bratt Smith (the mother of Macin) and the last part of the article was all about my non profit Textwich. On Sat 8/27 I am having an event to look for Macin Smith and Deborah Carver, there are others that maybe included. The event is called Bee Fed and Bee Found in Salt Lake City. it will start at 11 am at Liberty Park where the volunteers are having a potluck and will assemble hundreds of snack sacks with the flyers or Textwich messages on them. then we will distribute them to the homeless in Pioneer Park and on the streets. We have had a similar event on skid row where we bring a food truck to feed the homeless and then they look at a wall of missing people flyers and then we get tips on where to look for our missing loved ones. We are a group of families that work together to find pur missing. In Southern CA we also not only find our street kids but we help them get clean in detox rehab sober living and then help them get jobs. We visit kids in jails and help them get an action plan with places to live and jobs and rehab programs when they are released. It is amazing that we can find people with notes on lunches but we really do. The homeless are more willing to talk to family looking for people than the police.